Can we hear a big "Yowsa!" 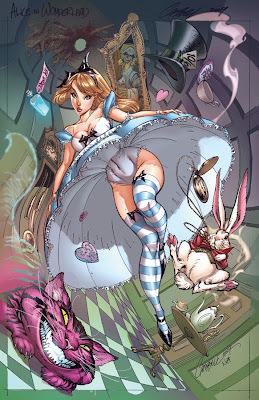 for J. Scott Campbell's Alice in Wonderland cartoon illustration? Here is more by the same artist. Notes on planning an Alice in Wonderland themed birthday party. Looks good! I'm not sure if I already linked to this. Sorry if it's a repeat. More information about Alice Returns - the sequel to American McGee's Alice video game. Speaking of American McGee's Alice Returns, here is more concept art for Alice Returns on SuperPunch. Last - this is oh so YESTERDAY but it seems that Alice in Wonderland style hairbands are making a comeback.